Support positive growth and vitality for future generations in the San Francisco Bay Area community and keep kids learning, creating, and playing. . . The San Francisco Symphony, together with San Francisco Unified School District Superintendent, is honored to invite you to become a Founding Partner of the Music Education Alliance. The Music Education Alliance supports the full scope of the San Francisco Symphony’s nationally recognized music education programs, which promote creative development, academic achievement and increased opportunities for children and young adults across the diverse spectrum of Bay Area communities. Join the Music Education Alliance and provide San Francisco’s youth with the essential building blocks needed to become our next generation of artists, scholars, inventors, engineers, scientists, and leaders! Music education enhances academic achievement and the way children view the world around them. It exposes them to the full spectrum of the human condition and prepares them for a future of personal and professional success. Leading neuroscientists continue to research and uncover benefits of repeated exposure to music as a component of brain development in children and adolescents. Researchers at Northwestern University have published findings that indicate "musical experience strengthens neural, perceptual and cognitive skills . . . throughout the lifespan." Music education is associated with gains in math, reading, cognitive ability, critical thinking, creativity, and communication skills. It also has been shown to improve motivation, concentration, confidence, empathy, and teamwork—all building blocks for a future of prosperity for San Francisco’s youth. Technology alone is not enough. It’s technology married with liberal arts, married with the humanities, that yields the results that makes our hearts sing. It is with great pride and passion that the San Francisco Symphony provides one of the most extensive music education programs offered by any American orchestra, bringing music into classrooms throughout grades 1-12 in the San Francisco Unified School District, free of charge. The arts give children the tools for creative thinking, and creative thinking not only serves children in every aspect of scholastic development, but it also creates people who think outside the box in whatever they end up doing. 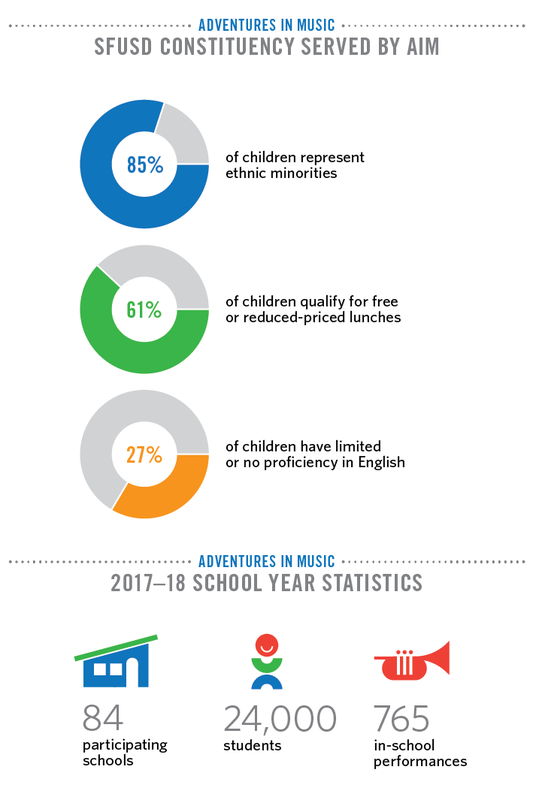 For nearly three decades, Adventures in Music (AIM) has provided every single child in SFUSD grades 1-5 with equitable and interdisciplinary music education. AIM integrates music-related learning experiences with Common Core subjects such as social studies, science, language arts, and visual arts through 1) thematically-linked ensemble workshops in the classroom 2) specially designed curricular units 3) professional development orientation for teachers and principals 4) a special concert by the San Francisco Symphony at Davies Symphony Hall. Your partnership in the Music Education Alliance will help secure the foundation of the Symphony's innovative music education programs, which serve more than 75,000 students in San Francisco’s schools each year. Join us to provide leadership in delivering the next generation of landmark education initiatives in our city’s schools. Concerts for Kids provides a heavily-subsidized $8 ticket and study materials for more than 25,000 children in 20 counties across Northern California to attend special weekday concerts at Davies Symphony Hall. For many children, Concerts for Kids presents the only opportunity to experience classical music on an international stage. Music and Mentors provides free music coaching, instrument repairs, and supplies such as bows, reeds, and sheet music to more than 1,200 students in 21 SFUSD bands and orchestras grades 6-12. SFSKIDS.org provides free and interactive online education resource for more than 2,000 children per day from more than 25 countries. Youth Orchestra provides tuition-free, pre-professional orchestral training, and touring opportunities for talented young instrumentalists ages 12-20. Youth Orchestra members often go on to join internationally acclaimed symphonies as both musicians and highly-skilled administrators.